The Orwetoveni community project aims to provide social, educational and recreational services to a deeply marginalized community, with an emphasis on activities for young people. Orwetoveni is on the outskirts of the formerly black-only residential area of Otjiwarongo. It is an area of informal settlements. For the large part, people in this area live in extreme poverty and as a consequence have little to no opportunity to support basic needs such as food, shelter, health and education, let alone recreational facilities. The idea for a project in Namibia was first brought to us in mid 2013 by the Rotary Club of Macquarie Park in Sydney. 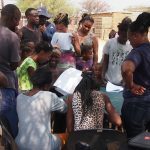 Established relationships already existed in the town of Otjiwarongo in Namibia, as did a keen enthusiasm to help a marginalised community; what was lacking was expertise in community development which is where indigo foundation could contribute, and support. Prior to initial discussions with us, a proposal had been received by the Rotary Club of Macquarie Park from the Municipality of Otjiwarongo to build a Youth Centre in the informal settlement area where the most marginalised youth of the town live. The centre would be dedicated to providing social, educational and recreational services to the community, with an emphasis on youth activities and community welfare. The proposal subsequently underwent our rigorous assessment process, the outcome highlighting the need for further community consultation with a view to developing a robust plan to take the project forward and importantly, adhere to our guiding principles of community ownership, sustainability, equity and transparency. In 2014 indigo foundation conducted a needs assessment and spent time building relationships in the community. During the visit, time was spent engaged in deep community consultation – with groups of varying age, gender and community standing. What we found largely confirmed our understanding of the situation – which was encouraging in terms of the big picture, but also vitally important in terms of ensuring sustainability. We also learnt that within the area of the informal settlements, there are large numbers of teenage heads of households and of grandparents caring for orphans. Student pregnancies, substance abuse, illegal abortion and teenage suicide were reported to us as issues of great concern. Depression was also recognised as a common problem, albeit most likely not diagnosed or treated as such. The majority of residents in the informal settlements live without electricity or household water connection. Water is purchased by the council and distributed through water points on a pre-paid system. Physical and sexual abuse was reported as not uncommon and there are no provisions for support for gender based violence. Many children are undernourished and partially dehydrated and often have to walk long distances to school. Lack of access to food and water, and caring for family members who are unwell can mean children do not attend school, despite primary school education being free and compulsory in Namibia. Abject poverty is commonplace and the psychosocial impacts of these family and community dynamics are devastating and typically go on to transcend generations. Regardless, one could feel a real sense of hope in the town and an enthusiasm to progress and identify new initiatives; despite their seemingly dire circumstances, the community still appeared to have motivation to improve their situation. Namibia was colonised by Germany in 1884; it was known as “South West Africa” until Independence in 1990. With a population of approximately 2 million, Namibia is said to have the highest degree of inequality by income distribution in the world. Approximately 50% live below the international poverty line and, as with other African countries, the economy suffers greatly from HIV/Aids. Whilst the country is slightly larger in area than New South Wales, it is predominantly desert. Otjiwarongo has a population of approximately 40,000. There are high levels of inequality and HIV/AIDS is pandemic. The residential area is “the great divide”. Women generally survive longer than men (predominantly due to HIV/AIDS), but are low income earners. Women and children are the most vulnerable and there are an ever growing number of orphans. Enormous numbers live in poverty in informal settlements – some in mud huts with no water or electricity; water is purchased from shared “wells”. The majority of families have more than five children per household and they struggle to survive by doing odd jobs such as domestic work and street vending. The little income the families earn is geared to keep them alive and in most cases cannot pay school fees for their children. In the rare case of families who can send their children to school, most of them cannot afford to buy school material such as text books or pencils. As a result the majority of these families choose very cheap, but usually poor schools for their children. These schools are themselves facing daily financial challenges and are therefore typically without libraries or other basic educational resources and services – computers are but a dream for these schools. Yet these children are examined on the same basis as children from affluent families who have access to the best schools with all the necessary facilities. For the children from poor families who are fortunate enough to be attending school, continuing with their education remains an enormous challenge. Many of them subsequently drop out due to a variety of reasons but very often financially driven. It is not unusual for children of these large families to be held back from school to care for their younger siblings while their parents go to work, or worse – seek comfort in alcohol and/or drugs. Needless to say, the psychosocial impacts of this family dynamic are devastating and it typically goes on to transcend generations. Physical and sexual abuse is not uncommon. Children have to walk long distances to school – if they are able to attend school. Many families are totally without employment and can barely afford to survive, let alone send their children to school. If they are fortunate enough to secure farm work, it would typically be in remote rural areas where there is no access to schools so they are then faced with the option of leaving their children with family or friends in town so they can go to school, or try to secure a place in a “hostel” (best described as boarding school, but very basic). Unfortunately, access to the fundamental human needs of food, water, shelter, safety and education is not necessarily a given in Otjiwarongo or Namibia as a whole.